When did free speech become a British 'value'? ON A COLD SPRING DAY, three men took to a small platform in the capital city of a western European nation to speak out against a horrific event. Days earlier, the bodies of 13 people lay strewn on the streets of a city 380 miles away – civilians gunned down without warning for exercising freedom of expression. The murderers who carried out this atrocity even stood over some of their wounded victims and pumped bullets into them with assault rifles. The three men who took to the platform days later called for those who supported freedom and democracy to face down these murderers. For their trouble, these three men were arrested and thrown in prison – charged with exercising free speech. This was not, however, some reaction to the horrific killings at the Charlie Hebdo magazine in Paris – these murders took place on the streets of the Irish city of Derry in 1972. The gunmen were British soldiers and the three men thrown in jail were Irish republicans who dared to speak out against the killings by addressing listeners at Speakers' Corner in London's Hyde Park – proclaimed in Britain as the home of free speech. 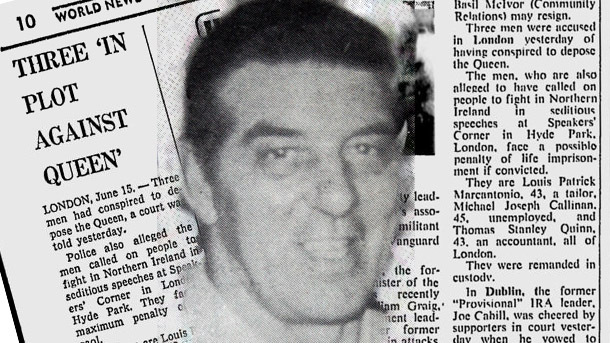 Joseph Callinan, Louis Marcantonio (my grand-uncle) and Thomas Quinn, all working-class Irishmen who emigrated to London in search of work, found themselves imprisoned for almost a year before eventually being hauled before the courts at the Old Bailey in January 1973 on the charge of “Treason Felony”, which carried a death sentence. The charge was eventually dropped and the three men remain the last ever people to be charged under the Treason Felony Act 1848. Another charge, accusing the men of “conspiring to fight against Her Majesty's forces” was also withdrawn. The basis for this charge was their call for people to resist those who had carried out the massacre in Derry. The prosecution had also alleged the three comprised the upper echelons of a previously unknown group named the “National Minority Defence Force”. Joseph, Louis and Thomas were, eventually convicted of seditious utterances for making “inflammatory comments” about the presence of British military forces in Ireland. As they had already spent 18 months in prison on remand, their final sentences of between nine and eighteen months in prison were suspended. Police officers escorted the three to a ferry at Holyhead and they were deported to Dublin – and strongly warned against returning. Following the horror of the recent Paris attacks on the Charlie Hebdo magazine, British Prime Minister David Cameron sought to portray Britain, and the West in general, as some sort of bastion of free speech. “I think we should recognise the values that we have in European countries of believing in democracy and free speech, freedom of expression, the right to offend people and be offended,” he said in Paris. When did freedom of speech become a British value, precisely? It certainly wasn't a value in 1972 when those three men were locked-up for a year and a half for speaking their minds. It certainly wasn't a value when the British Government banned democratically-elected representatives from speaking on national airwaves in the 1980s and 1990s. And it certainly wasn't a value when the British Government justified the bombing of a Serbian TV station and the slaughter of its employees just before the turn of the millennium. It would appear “free speech” is only a British value when the Government agrees with what is said.